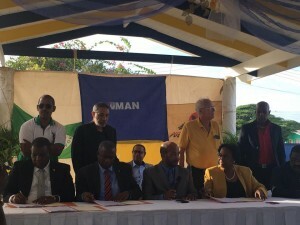 WILLEMSTAD – Un Korsou Hustu (UKH) from Member of Parliament Omayra Leeflang is once again negotiating its participation in the current government coalition. According to reliable sources, last Saturday the coalition parties met with UKH representatives about expanding the coalition. On Sunday there were also conversations between the ruling party MAN and the UKH. UKH indicated that the parties are just orienting about the possibility of expanding the coalition with their party. The meeting that took place on Sunday was the initiative of the Minister of Finance Kenneth Gijsbertha who was also the ‘formateur’ of the government. The UKH delegation consisted of the party’s president Billy Pandt; political leader Omayra Leeflang and the secretary general Cor de Graaff. According to UKH the parties did not make any decisions but spoke about important points that could lead to the expansion of the coalition. The parties will continue with their conversation rounds during this week. Leeflang already indicated that her party will not join the coalition if she cannot have a say in the government agreement. “When there were talks about which parties will get the different ministries, we did not mind which one we will get. We did not demand anything at that time. But now that we are talking about joining the coalition we have our demands. We want to have a say in the coalition agreement,” said the leader of the UKH party. Some of the issues the party wants to see in the coalition agreement are the pensioners, the economy, job creation, and government houses. Specifically how many houses the government is going to build to accommodate all those on the waiting list. The Prime Minister stated that his government is ready to expand the coalition and if his party has to sacrifice a ministerial post, they are will to do that. But they will have to discuss this with the other parties.